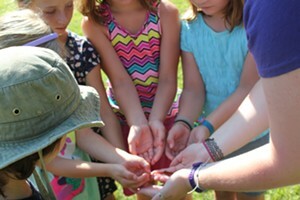 Meet Some of Vermont's Young "Makers" | Features | Kids VT - small people, big ideas! Meet Some of Vermont's Young "Makers"
By now you've heard about Ahmed Mohamed, the 14-year-old Texas freshman who built a digital clock and brought it to his suburban Dallas high school. Ahmed, who is Muslim, made headlines in September because school officials said they suspected his clock was a bomb — he was handcuffed and fingerprinted by police, and suspended from school for three days. But though local officials panicked, national figures celebrated the boy's ingenuity. President Barack Obama tweeted his support. "Cool clock, Ahmed," he wrote. "Want to bring it to the White House? We should inspire more kids like you to like science. It's what makes America great." Democratic presidential candidate Hillary Clinton sent her own supportive tweet. Facebook CEO Mark Zuckerberg invited Ahmed to visit the company's California headquarters. Twitter offered him an internship. After Ahmed called the Massachusetts Institute of Technology his "dream school" on MSNBC, MIT physicist Chanda Prescod-Weinstein invited him to tour the campus. "I just want to say, you are my ideal student," she told him. Obviously that's not because Ahmed got suspended — it's because of his creativity and curiosity. It's because he made something on his own, rather than waiting for instructions or an assignment. There are lots of Vermont kids who possess this same spark. They haven't gotten as much press as Ahmed, but they're creating stuff, too — building robots, crafting, making bracelets with LED lights and sewing with conductive thread. In many cases they're not operating entirely on their own; a growing network of DIY evangelists is helping them. 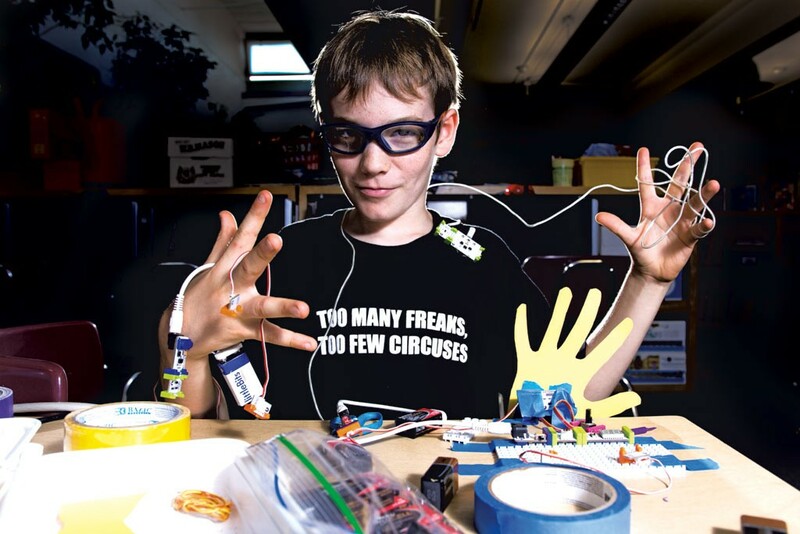 Inspired by the maker movement — popularized 10 years ago by Make magazine and Maker Faire founder Dale Dougherty — Vermont librarians, teachers and scientists are creating "maker spaces" where kids and adults alike can tinker, using traditional as well as high-tech tools. Basically, whatever's handy. Nicole Westbom, the children's librarian at Kellogg-Hubbard in Montpelier and the organizer of its Tech Tuesdays, argues that the maker movement is simply about "using what you already have to create something new." On a busy Thursday afternoon she pauses briefly from her job manning the children's desk to whip up a cup of synthetic snot with food coloring and Borax. According to Westbom's definition of the maker movement, this plastic cup of fake snot is just as much a part of it as the e-crafting and circuitry activities she leads in her weekly kids' tech sessions. 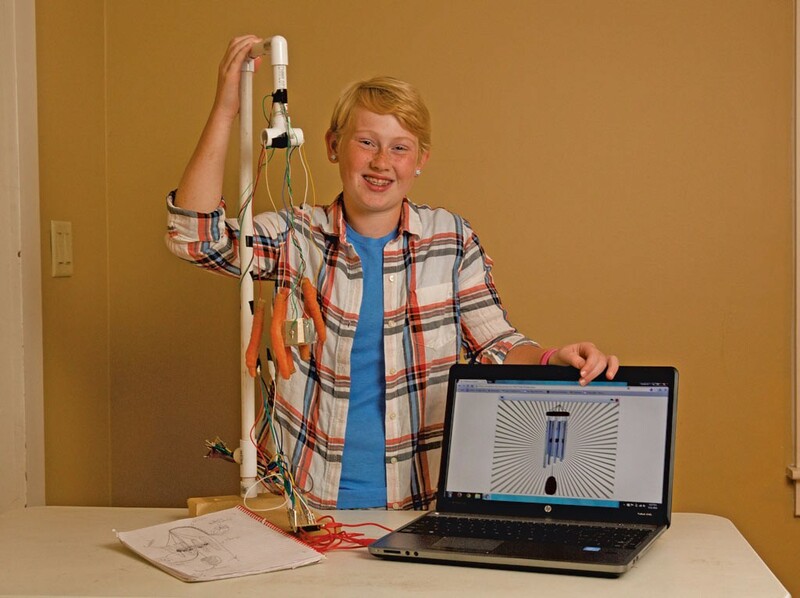 For the Kids VT Tech Issue, we caught up with five local maker kids who love to innovate, experiment and imagine. All of them — much to their parents' delight and distress — love to take things apart to see how they work. And like Ahmed, all of them possess a curiosity and creativity that's inspiring to behold. Before I leave Torin Callnan's house in North Middlesex, he tells me we have to try out his ballista. For those who aren't up on ancient weapons, it's a standing Roman crossbow. 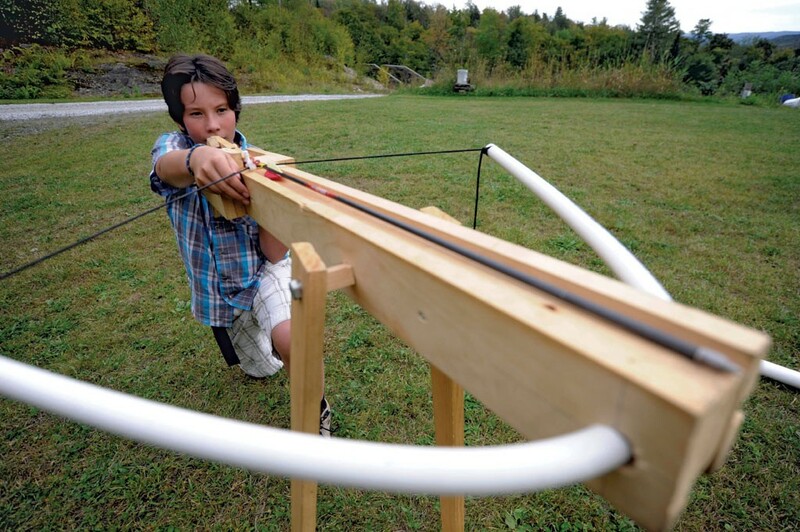 His is made of wood, with a piece of PVC pipe for a bow. The handmade arrow Torin fires doesn't make it to his target across the lawn, but it gets pretty close. He also wants to show me his homemade potato cannon but, considering it requires hair spray and fire, we decide to save it for another time. Torin would happily spend all day in his basement lair listening to his favorite audiobooks and building objects inspired by them. Back when he was homeschooled, he could while away the hours building and making things like a papier-mâché model of a power station. But now that he's a seventh grader at U-32, he doesn't have as much unstructured time. He's joined a Lego robotics league after school, though. And there are always weekends and long summers to linger in his workshop, thinking up his next project. Ultimately, though, he's less interested in the future than in the past. What does he want to be when he grows up? "A historian," he says. Why make things: "I like building stuff. I like having the satisfaction of seeing a product that actually works." Biggest challenge: "The crossbow, because before I thought of PVC, I was trying to carve branches or small trees into a bow-shaped bow, and that didn't really work." What's next: "Since the ballista that I made was supposed to be a model, I would scale up. I'm thinking about building a bigger one. Do you know John Flanagan? He wrote Ranger's Apprentice and The Brotherband Chronicles. In The Brotherband Chronicles, the main character builds a giant crossbow that he calls 'the mangler' because it shoots small trees and stuff. And that really inspired me. He mounted it on his boat, so I'm thinking about building a boat with a ballista and testing it on Lake Champlain." When I walk into McKenna Marquis' light-filled house, she ushers me over to her newest invention — a set of carrot wind chimes hanging in the living room before an open window. Four orange veggies and some metal sensors dangle from a piece of pipe. When the carrots tap the metal, a computer emits a metallic tinkling sound. To make her chiming carrots, McKenna used a circuit board called a Makey Makey (rhymes with "achy break-y"). The popular maker device, which connects to everyday objects on one end and a computer on the other, essentially enables the computer to read household items as a keyboard. McKenna can define what those objects can do by writing instructions using a program such as Scratch. 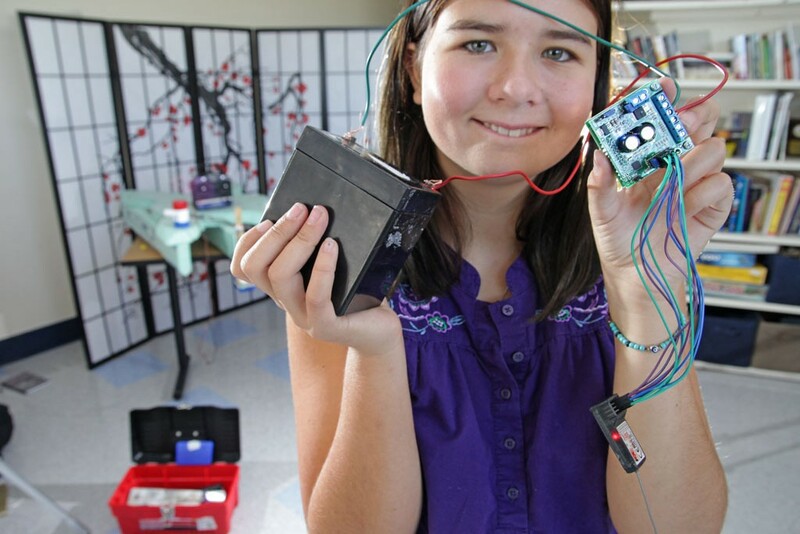 McKenna's invention is an ingenious variation on a classic Makey Makey project — the banana piano. Google it, and you'll understand. Although the seventh grader at North Country Union Junior High School clearly has an affinity for the high-tech aspects of the maker movement, her true love is for her tree house, which she's been constructing for years. Long before she'd ever attended Tech Savvy Girls Camp or heard of a Makey Makey, she was hammering boards into her favorite backyard tree and trying to attach an old slide to the trunk. Coolest failed project: "I've tried building a remote-control helicopter drone-type thing. I had a helicopter and it stopped working ... so I took the motor out of a light set and the pieces of the helicopter, like the wings, and I put them on the motor to see if it would spin ... but it didn't really work." What's in her sketchbook: A design for a doll bed for her little cousins; sketches for cool motorized objects; a list of all the things she wants to do in her tree fort. 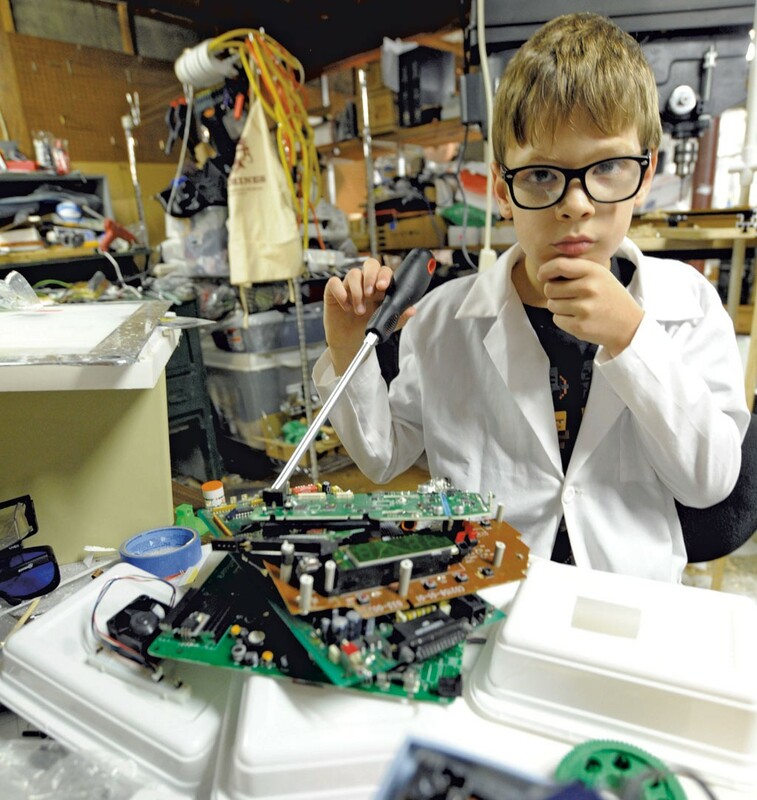 Advice to kids interested in being makers: "It never hurts to try. Try, and if you like it, that's great, and if you don't, try something different. Take all the opportunities you can get." Charlie Wallich's house, on a quiet street five minutes from downtown Montpelier, is filled with deconstructed machines. He happily tours me through his bedroom, piled high with coding books, and his basement, littered with the innards of old computers that he's dismantled. In his white lab coat, he could easily pass for a serious, if pint-size, scientist. "Down in the basement are all the things that we're not ready for humans to see yet," he explains as we make our way back up the stairs. "All the stuff down there is somewhat experimental. It may explode or cause sparks if used by an untrained person." Charlie is a student at the progressive River Rock School, which doesn't segment its students into grades; he declines to reveal which one he would be in. His favorite material to work with is a surprising one — cardboard. "Because it's just so versatile," he says. "I can make whatever the heck I want with it." One of his favorite things is something he calls "the imaginative box." All you need is a box big enough to sit in and your imagination, and it can transport you anywhere you want to go, he says. "And, sure, you're not actually flying over a mountain, but if you're having fun and enjoying yourself, then my work here is done." Coolest thing I've ever made: "One of the things that's in progress is a calculator put on paper. It's the inner workings of a calculator, but on paper. I just took apart a dead calculator, and I took out all the parts (inside) that actually worked and put it on paper." Career aspirations: "Why limit myself to one profession? Scientist, inventor, engineer, physicist, that kind of thing." Thoughts on frustration: "Failure is really a success in figuring out a way that doesn't work." Amelia Payne has the same preoccupations as many 16-year-olds, like studying for her SATs and getting her driver's license. But when I stop by her classroom at South Burlington's Big Picture school in mid-September, she's focused on building a remote-control lake monster. She pulls out the "ChamBot" to show me — the partially completed creature is mint-green and made of lightweight foam. It's about the size of a coffee table. Amelia and her team members are designing it to compete in the ChampBot Challenge at the Champlain Mini Maker Faire at the end of September; Amelia is helping to build and program the aquatic robotic vehicle, which must complete a variety of tasks to win. Last year, she says, her team constructed its remote-control lake monster with motors that weren't waterproof and it was "a nightmare." This year they're adding bilge pumps and doing a trimaran design that she hopes will make the 'bot more stable. "It kind of snuck up on me. I didn't realize it was in, like, two weeks," she says of the competition. "Now we've really got to pull it together." The North Ferrisburgh teen went to the independent Red Cedar School in Bristol for elementary and middle school, which she says allowed her time during the school day to explore her maker tendencies. Students there would bring in broken CD players and remote-control cars, take them apart and use the motors to make their own creations, like paint spinners. At Big Picture, a separate school within South Burlington High School that's all about individualized learning, Payne has dabbled in robotics, cybersecurity, and game and website design. Last year, as part of a school project, she even created a web page for her fledgling babysitting business. On her early maker years: "I spent a lot of time playing with hot-glue guns and had the burns to prove it. I went through a stage making a lot of very complicated spitball guns and crossbows to shoot pencils and stuff." On being a female maker: "I'm a girl, and I'm involved in making stuff, which is not exactly common. One time I tried to go to the Cyber Security Club, and I got there on the first day and was like, 'Oh, my God, I finally found a tech club that girls are in!' Turns out I was in the wrong room — it was the Scrapbooking Club." Advice for younger kids with maker aspirations: "Don't be afraid to ask questions, because people might be talking over your head, but they might not realize they're talking over your head. They're probably not trying to be obscure." Fifth grader Julian Holcroft's bright eyes and devilish smile hint at the quick mind that lurks beneath. When I meet him at Burlington's Integrated Arts Academy at H.O. Wheeler, he's sitting at a table in an alcove of the library that functions as a computer and maker lab. Before him is a jumble of litteBits — electronic building blocks that snap together with magnets. His black T-shirt declares, irreverently: "Too many freaks, too few circuses." When I ask him about it, he shrugs. He'd rather focus on the project he's making. He's traced one of his hands on paper, cut it out and taped it to a knob on a littleBit. When switched on, his contraption will make the hand appear as if it's waving. IAA's librarian Shannon Walters stocked the magnet school's maker lab with tools including $300 worth of littleBits, "squishy" circuits and 3D-printing pens. Students can use the technology during library time, lunch and recess. "It's not everybody doing all the same project in the same way," she says. "That's like being back in kindergarten where you have to color within the lines. A lot of the time I think our maker space tools are just about giving them the possibility and then getting out of their way." Julian's a frequent visitor to the IAA's maker space. "I can't be in front of Julian without him wanting to dig in and see how it works," Walters says. "You can pretty much give him anything, and he'll sit and play." Julian also regularly visits Burlington's Generator, a maker space that opened last year in Memorial Auditorium, where he likes to check out projects college kids have made. "I really want to be an engineer when I grow up," he says. On his early maker years: "I started [building with] Lego at around 5, and then at 6, I started using the Technic sets —it's just a ton of beams, axles, gears and stuff. You're supposed to do it when you're 16, but I do it, and I'm 10. Mostly I build the set project and then I start adding stuff on to it, and stuff goes from there." Future aspirations: "I'd love to make a lawn-mowing robot. I've seen someone who made one. It actually mows your lawn. It's over 600-something dollars." What's cool about littleBits: "With littleBits, you can just build anything you want, basically. It's got magnets in it so you can't connect them the wrong way, which is helpful. What I like about it is it's entirely interchangeable."